Immerse yourself in a sweet match-3 adventure,make lines of 3 or more juicy fruit, clear the board and crush yourway to the top! Can you handle the Fruit Challenge? Play now and find out! Experience the classic puzzle game and enjoy thousands of funlevels filled with challenging puzzles to train your brain. Matchthe sweet fruit to reach high scores, win awesome boosters andbonuses and complete all the different missions. • Collet fruit and win points. 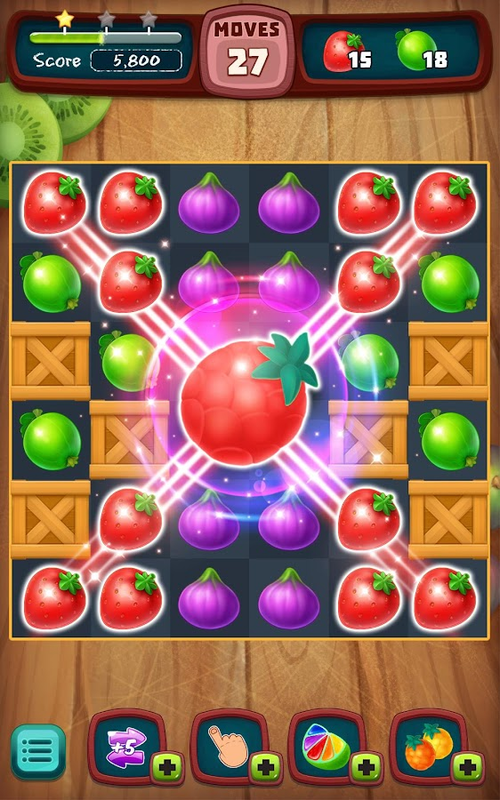 • Move and match 3 or more fruits to remove them from theboard. • Enjoy thousands of exciting levels. • Unlock fun boosts that will help you on your journey. • Complete the missions and clear levels. • Beat the challenges and overcome obstacles on your way to asmashing victory! • Play with your friends and compete for the top scores. • Addictive game mode, colorful graphics, and fun effects. Fruit Challenge puzzle game is suitable for all ages to play andenjoy! Your goal is to make lines of juicy fruits and solve all thechallenging puzzles. Play through thousands of exciting levels andcollect different rewards. Download now from to your Android or Tablet device and startmatching fruit n this highly addicting match-3 adventure! - Classic and addictive match-3 gameplay. - Colorful graphics and cool visual effects. - Thousands of tasteful levels packed with fun puzzles! - Match the juicy fruit and win levels. - Earn powerful boosts and blast your way through thechallenges. - Compete with your friends for the top scores! Don't’ wait any longer! Try out this fun game and enjoy the mostdelicious and addictive puzzle adventure! Have fun swapping and matching the fresh fruit! Blossom Blitz Match 3 is an addicting and fun puzzle game, free toplay straight on your Android or Tablet device! Spend a relaxingday at the lovely flower garden, explore thousands of beautifullevels, blast colorful flowers and win levels. This completelyaddictive Blossom Blitz Match 3 flower game will keep you occupiedfor hours! Link the flowers and blossom blast your way throughhundreds of amazing match-3 levels filled with amazing graphics,unique items and splendid boosters. Plunge Into Adventure! Clearthe blossom garden, and beat the challenges in this awesome puzzleadventure. Try it out now and get ready to enjoy the amazingmatching game full of beautiful flowers. Play this fun flower gamethat will take you on the most wonderful journey! Match Flowers andCreate Combos Start blasting, and create special combos to get acool explosion! - Smash and match 4 flower buds to get a stripeditem of this color and create a line blast. - Match, pop, and burst5 lovely items in an L or T form to get a bomb that will explodesurrounding items. - Match and hit 5 colorful figures in a row toget a rainbow blast. Why you’ll like it: 🌸 Exciting blossom match-3levels: tons of fun, featuring unique boosters and explosivecombinations. 🌸 Addictive gameplay: swap and match the brightflowers, and be part of a breathtaking adventure! 🌸 Fun game withsimple, casual gameplay that’s easy to learn but challenging tomaster. 🌸 Thousands of fun and exciting blossom levels. 🌸 Beautifulgraphics and effects. 🌸 There is no life or time limit, so you canplay as much as you like. 🌸 Completely FREE, download today to yourAndroid or Tablet device and match your way to victory. 🌸 Neverending match-3 bloom blast fun! Clear the board from all thecolorful buds from the blossom yard to win levels! Reach highscores and try to get 3 stars on every blooming level. Play thisincredible bloom blast puzzle today, and get ready for an addictiveride. Play now, link 3 beautiful flowers, create amazingcombinations and solve the brain teasers to blast them away and winexciting rewards! With so many exciting levels, and awesomeboosters and bonuses, Blossom Blitz match-3 game is a must have foryour Android device - You will bloom for sure! Play this addictivematch 3 blaster game and experience endless hours of fun andfascination! It’s magic and spells time at the secret witch town! Swap and matchmagical items and explore tons of enchanting levels in this coolonline free game. Magic Clash is a super fun match-3 puzzle gamefeaturing some cool witchcraft items and spooky boosters. Startyour adventure today, play now and experience hours of endless funmaking matches and solving puzzles. Enter a world of witchcraft andpotions and collect charming items. Dash through hundreds ofenchanted levels, solve the fun puzzlers and complete all themissions. Improve your matching skills and enjoy a smooth andtotally addicting gameplay. ★Game features:Fabulous graphics anddesigns.Hundreds of thrilling match-3 puzzles. Free to play, nointernet connection is required!Hours of entertainment areguaranteed. Share the fun with friends and see who can get thehighest score! Join the thrilling puzzle adventure, it’s anenchanting experience. There is no time limit so you can play atyour own pace. Unlock exciting power-ups and match them with eachother to generate big explosions! Be sure to check for regularupdates and new levels. Playing our awesome game is easy. Here’swhat you need to do: - Swap and match 3 magical items. - Completethe missions set at the beginning of each level. - Reach the targetand win points. - Create special combinations to unlock awesomepower-ups and bonuses. - Try to achieve 3 stars on every level. -Take your time and plan your moves carefully. Indulge yourself inthis magical match-3 adventure, play now! It’s time to crush gems in space!Collect matching diamonds to earnpoints in this awesome match 3 game. Start your adventure today!Play the amazing Cosmic Crush game for FREE and experience hours ofendless fun and entertainment.Journey through hundreds ofchallenging levels packed with shiny gems and fun puzzles, completethe missions and clear the galactic board. Boost your experiencewith awesome power-ups! - Match 4 gems to get a striped item ofthis color and create a line blast. - Match 5 diamonds in an L or Tform to get an amazing boost that will explode all items around it.- Match 5 sparkly rocks in a row to get a special colorful power-upthat will burst all items with the same color.Addictive PuzzleOnline Game! * Swap and link the gems. * Clear hundreds of awesomelevels. * Enjoy a smooth gameplay. * Reach high scores. * Solve thecosmic puzzlers. Download this super fun board game for free andstart matching the gems! Cosmic Crush Features: * Amazing designsand visual effects. * Fun puzzles and challenges. * Shiny beautifulgemstones and awesome bonuses. * Free to play! * Addictive match-3online game for the whole family to play and enjoy. Have funplaying this cool puzzle game! Download for free Blueberry Bash, the most exciting fruit matchpuzzle game. Match three fruit to burst and remove them from theboard. There are hundreds of fun levels to enjoy in this addictingmatch-3 puzzle game so play now and get ready to beat all thechallenges. Experience endless fun in the lovely farm filled withawesome puzzles, colors, unique items and boosts. Blueberry BashFeatures: - Fun boosters and bonuses- Vivid colors and beautifulgraphics- Easy to learn but can be tricky to master- Awesome levelsfilled with fun challenges and puzzles - Exciting Match 3 Adventure➢Swap and match and win levels!- Collect the fruit and complete themissions- Win levels and advance along the map- Try to get 3 starson every fun level Everyone will enjoy this addictive match-3puzzle game. Join the amazing adventure at the farm and collect thesweet fruit to win prizes. Match and collect sweet candy in this funCandy Mix match-3 puzzle game. It’s the best game to play when youwant to relax and enjoy awesome levels filled with delicious candytreats to satisfy your sweet tooth!Set on a fun quest and explore hundreds of amazing levels, match-3puzzles and challenges!Candy Mix Features:- Beautiful graphics and designs. Explore the luscious kingdom ofcandies!- Collect candy and win points.- Puzzle games are much easier when you get some help! Unlockspecial boosters ,power-ups and smash the candy.- Create big matches to get explosive bonuses that will help youblast through the challenges.-Create jelly blast combos to achieve maximum score and beat otherplayers.- Beat the challenges and win levels.- Share the match-3 awesomeness with your friends and compete forthe highest score.- Try to get 3 stars on every level.Join the Candy Mania!Match 3 or more candy treats of the same kind to create a lineblast and clear the board. Get the most addictive candy match gametoday and journey through hundreds of sweet levels and excitingworlds. Play online or offline-no internet connection isrequired!It’s fun and simple!Move and connect 3 candy pieces to win points and completemissions. Keep in mind that your moves are limited so you betterfigure out a strategy and plan ahead.Collect the candy and win levels.Enjoy playing our awesome game and solve all the candypuzzles! Get ready for a fun diamond matchingadventure!Diamond Extreme Rush is a super cool free puzzle game featuringsome shiny gemstones, addicting levels and awesome match-3puzzles.Match the diamonds to earn points and win levels. Play now andenjoy hundreds of exciting levels!Swap and blast the gems• Make lines of 3 gems in this relaxing and fun puzzle game.• Collect the precious rocks!• Unlock splendid boosters that will help you clear levels.• Create massive explosions by linking 4 or 5 gems.• Beat all the challenges and win hard levels.• Complete the missions set at the beginning of each uniquelevel.• Try to achieve 3 stars on every level.Game Features:- Hundreds of challenging levels.- Awesome boosts and effects.- Free to play, no WiFi connection is required.- Endless match-3 exciting puzzles.- Shiny jewels and diamond pieces!Diamond Extreme Rush is a cool jewel matching game, with funlevels, sparkly gems, awesome puzzles and tons of excitingpower-ups and bonuses. Make special diamond combos to create bigexplosions, beat all the challenges and win difficult levels.Play now and discover a classic and most addictive gameplay.It is simple and fun and completely free to play! Make the most amazing tropical fruit shake in this cool match-3jungle fever game!Welcome to the sweetest adventure! Travel throughcolorful settings, swapping and matching fruit, clear the board andwin levels. Make juicy combinations and overcome all the obstaclesin this fun free puzzle game.Jungle Match Features: Free and funadventure at the tropical island.Hundreds of juicy levels filledwith fresh fruit and cool items.Colorful graphics anddesigns.Awesome boosters and power-ups to ease your experience.Howto Play:Swipe and link 3 or more fruits to create a linecrush.Collet fresh fruit and win points! Complete the missions andsolve the match-3 puzzles.Achieve 3 stars to get morecoins!Experience endless fun in this exciting match-3 world gamewith powerful boosters and amazing bonuses.Go on a thrillingjourney with Jungle Match and explore wondrous levels filled withjuicy fruit and delicious treats. 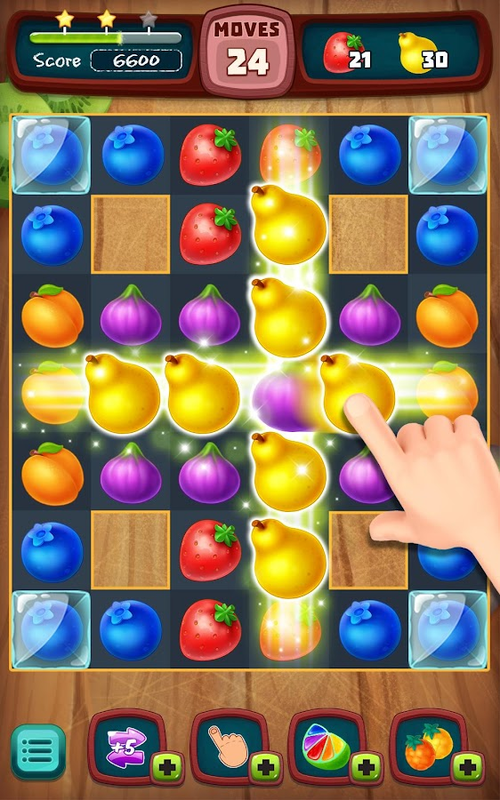 Play now and get hooked on thisawesome fruit matching puzzle game. Get it now for FREE! Loot Cave Match 3 is a fun puzzle adventure game featuring somebeautiful graphics, shiny diamonds and hundreds of challenginglevels. Swap and match 3 gems in this addicting puzzle game. Keepmaking matches until you clear the board and move on to the nextawesome level. Discover the match-3 fun! Complete the challengesset at the beginning of each level.Win points and reach highscores.Try to get 3 stars on every level and become the legend ofthe treasure cave. As you play, you have the option to unlockstunning boosts and power-ups that will help you blast your waythrough difficult levels. Create massive explosions by makingspecial combinations. - Match 4 diamonds to get a striped treat ofthe same color and create a line blast. - Match 5 items in an L orT form to get a special bomb that will explode all items aroundit.- Match 5 gems in a row to get a special colorful rainbow item.The colorful item can burst all gems with the same color. - Connect2 special boosters to create even greater explosions. GameFeatures:- Hundreds of sparkly levels packed with awesomechallenges - Amazing adventure at the secret diamond cave -Beautiful gemstones and precious rocks - Play and enjoy a classicgameplay- Eliminate all obstacles and win levels- Collect thediamonds!- Use the boosters to create big explosions and increaseyour score. Ready to find the hidden treasure?Download now and jointhe gem quest.Thanks for playing! 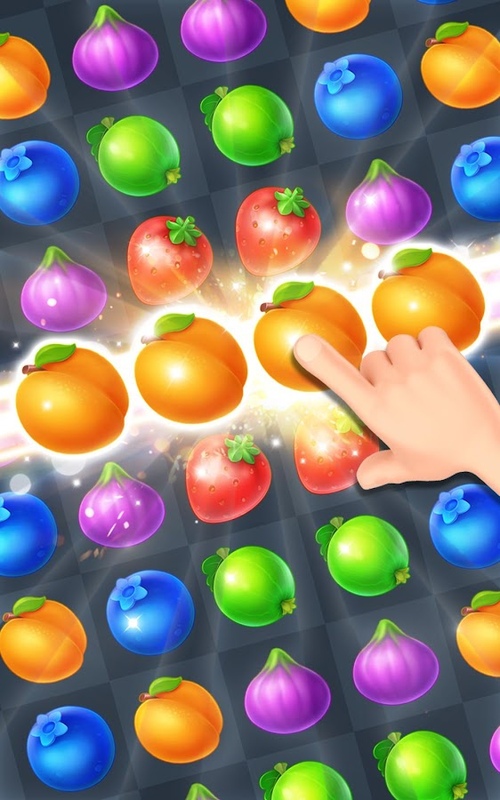 Fruit Go is a classic match-3 puzzle game filled with colorfulfruits and magical elements. The delicious fruits along your way ofjourney, and the endless puzzles make it both refreshing and fun!Bunny’s travel It’s the one of a kind brainteaser game! Yourmission is to travel with Dr. Birdy and Bunny and taste deliciousfruits in your journey. With Dr. Birdy’s help, you can solvedifferent puzzles and achieve goals, and in it enjoy the excitementand fun of crushing fruits. We have lovely graphics and soundeffects to make the game even more addictive!How to Play• Swap andMatch 3+ identical fruits!• Achieve your goal in each level!• Letthe Fruit Go! As many as you can!• Special fruit with magic powerwill come to help!• Use powerful boosters to clear obstacles!Uniqueepisodes and levels• Forest, desert, sea and snow land, all kindsof delicate and eye-catching scenes.• Special levels to achieve.Enjoy ice cream, soda, donut and other delicious food, and meethedgehog and lion in your journey.• Hundred of levels available nowwith more to come.Easy and fun- Easy-to-play interface, all youneed to do is swap & match.- With the colorful and powerfulitems, you can get rid of all blocks and enjoy theexcitement.Support Enjoy the game and share your feedback orquestions to: [email protected] fun playing Fruit Go now! Once upon a time, a new game appeared to lay claim to the title ofthe most charming Match 3 puzzle game in the world! Welcome toCharm King! Play now and embark on a magical journey through afairy tale kingdom, filled with fun, adventure, and humor. Alongthe way you will meet unforgettable characters and solvechallenging puzzles to help everybody live happily ever after.CHARM KING FEATURES: • Completely FREE to play with THOUSANDS ofcharming levels • ENJOY beautifully vivid HD graphics • RELAX andde-stress with soothing game play and audio • LAUGH OUT LOUD withhilarious fairy tale stories and cute characters • CHALLENGEyourself to solve tricky puzzles • PLAY and progress with friends •WIN spectacular boosts to blast through challenges • Alwayssomething new to unlock with DAILY and SEASONAL EVENTS! Please noteCharm King is completely free to play but some in-game items suchas extra moves or lives will require payment. You can turn-off thepayment feature by disabling in-app purchases in your device'ssettings. 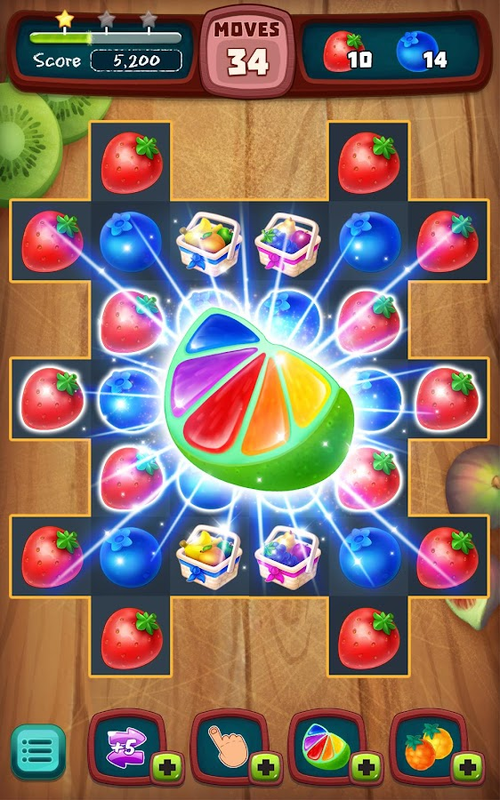 It’s the ultimate fruit matching fun!Use your skills to match 3 ormore sweet fruit of the same color and watch them blast!Play theawesome Yummy Fruit Match 3 game and discover a basket full offresh goods, colorful graphics, and unique boosts. Start yourexciting adventure now and work your way through thousands ofaddictive levels, collecting fruit and solving all the challenges.NEVER-ENDING FUN! * Match the fruit and win points. * Swap and linkthe sweet fruit in this relaxing and fun puzzle game. * Clear theboard and level up. * Complete the missions and solve the fun match3 puzzles. * Use powerful boosts and blast through the levels! *Play through thousands of levels and collect splendid rewards. *Boost your matching skills! * Create combos to generate massiveexplosions. * Train your brain and your fingers, and beat all thechallenges. AWESOME COMBOS!Create special combinations to blastthrough the different challenges. 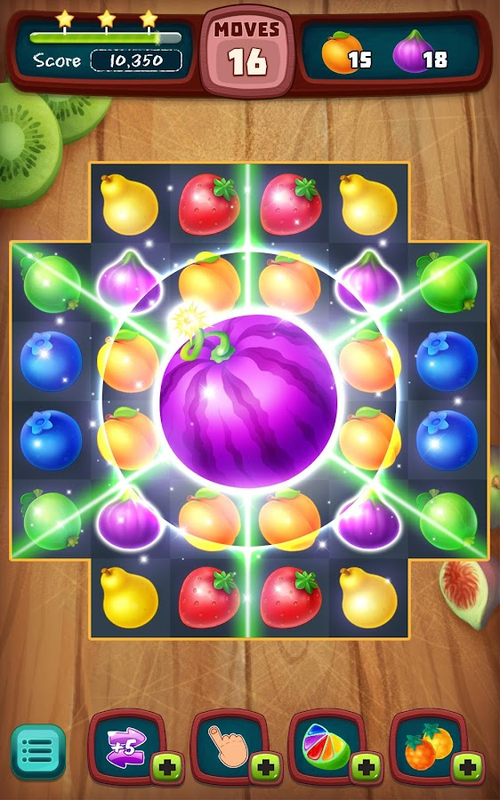 • Swap and link 3 fruit to createa line blast and remove them from the board.• Match 4 deliciousfruit to get a striped item of the same color to clear an entireline of items. • Match 5 fresh goods in an L or T shape to get abomb that will explode all items around it.• Match 5 fruit in a rowto get a special colorful rainbow bomb. • Connect 2 special booststo create an even greater explosion! Jewels Deluxe 2019 - Jewel Classic Legend is free classic match 3jewel game, now available on Android Market. Swap by touch to dropspecial jewels in awesome music in fun character to complete themission! How to play: There are three mode gameplay in game JewelClassic Game 2019. 1. Mode Classic: - This is the endless mode, youhave to play until gameover, but don't worry try your best to getyour high score! - Like all type of match 3 game, let's swap jewelsto get match 3 jewels - You get normal score. - Let's swap jewelsto get match 4 jewels - You get score and bomb jewels - Let's swapjewels to get match 5 jewels - You get score and special jewels 2.Mode Arcade - You have upto 2000 levels. It's very additive andchallenge. - Each level, your mission is making the mission jeweldrop to bottom -> You Win. - The timer bar alway run quickly.You always get more time by Pause button -> + Time. - There area lot of items in game when you play, It like: time item, bombitem... - At the end of game: You timer with exchange to score soyou need to complete level in quickly if you want get more score.And score <-> star you could get. 3. Mode Hard (Harder) - Youhave upto 2000 levels. It's very additive and challenge like modeArcade but its very hard because the random ICE will lock jewelsfrom the top. - Each level, your mission is making the missionjewel drop to bottom -> You Win. - The timer bar alway runquickly. You always get more time by Pause Button -> + Time. -There are a lot of items in game when you play, It like: time item,bomb item... - At the end of game: You timer with exchange to scoreso you need to complete level in quickly if you want get morescore. And score <-> star you could get. Feature: - There aremore than 2000 levels waiting for your adventuring. - The levelfrom easy with low level and upto hard with high level. - Multiplediffrence jewels type will appear in the game like: Jewel's bomb,Jewel explore row, Jewel explore cell, Jewel Hammer colorful. JewelGame 2019 is launch on Android Market and we always work hard tobring a great game for you. So let's support us by download thisgame - Play - Get relax. Thanks! The whole game is completely free.No option to buy anything.